The sports lending market continuously attracts new participants, some of which seem to leave almost as quickly as they arrived. However, experience and consistency are hallmarks of GSP. We have provided capital on attractive terms in periods of both market calm and disruption. In fact, in the face of the 2008 market turmoil, GSP Finance was one of few lenders in the sector that still had ample capital to grow its loan portfolio. During those disruptions, we put our capital to work for our clients and grew our loan book by underwriting new loans for our clients and by acquiring sports debt in the secondary market. Members of GSP have been leading lenders to the sports industry over the past two decades. 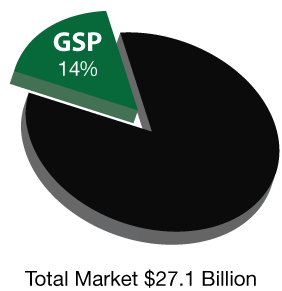 Since inception, GSP has put over $500 million to work for clients in the major North American sports leagues. *Debt market share includes transactions completed by members of GSP while at a prior institution. Excludes all league financings. Full league table credit allocated to all agents (Administrative, Syndication and Documentation) on a transaction.